From all of the staff at MORGADO LUSITANO, we welcome your visit to our wonderful facility here in Portugal. Morgado Lusitano has been synonymous with the Lusitano breed for more than 30 years and is committed to providing you with the best Classical Riding experience available. We operate a school that has both the horses, the training facility and the knowledgeable staff to achieve this goal. Morgado Lusitano has more than 20 horses on the premises and many of the horses that pass through our gates are green from the fields. Morgado Lusitano uses no shortcuts to its training schedule and it can take hundreds of hours over several years dedicated to each horse so that it achieves the High School training that the Lusitano breed is renown for. 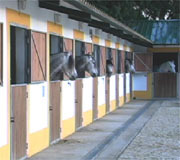 The horses that are entrusted to us are offered the best in care, are housed in large stalls, are well fed and are exercised daily. This attention to the horses basic needs results in Lusitano horses that are calm, generous in spirit and willing to learn. A number of horses are full time residents of our stable, and are the stars of the clients hearts, as they introduce many riders, often for their first time, to the joys of classical skill. These specialized schoolmasters are just a sample of the Lusitano horses, and there are nearly a dozen high school horses that we may provide for you to ride. Morgado Lusitano has had a long standing reputation for entrusting the teaching of their horses to superior headmasters. Several have been riders from the Escola Portuguesa d' Arte Equestre and this continues today with their riding experts, Rodrigo Matos and Paulo Sérgio Perdigão. Morgado Lusitano also provides rider instruction, and from the very start uses the Classical methods that have been passed down through the centuries. This is often done with the help of associate instructors and learning under them is certainly fun for everyone. Often there is so much activity in both our outdoor arena and in our indoor picadero that at Morgado Lusitano sometimes just watching the others ride is half the entertainment! One of the advantages of having a large estate house is the atmosphere it brings to everyday events. This is especially noticeable during the times where eating or relaxing is part of your holiday. There are several rooms that clients seem to gravitate to, one of which is the library/study and the other is the dining room. 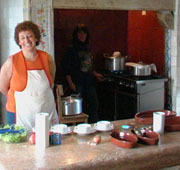 The meals that are prepared for while you are a guest at Morgado Lusitano are tasty and abundant. Each day the chefs prepare delicious traditional Portuguese dishes and accompany them with a selection of excellent Portuguese wines. Portuguese food is generally good, but with the care of our chefs it takes on an especially appealing taste! The food is served family style in out main house dining room, and the lighting and candles reflect the warmth of the company that you keep. In the morning a nice European coffee is appreciated and at the end of the day a glass of cold Portuguese beer can really hit the spot. It is also a quiet setting to rest or talk with friends about the lessons of the day. In addition to the horse care staff, the restaurant manager and assistants will seek to assure that you are comfortable while you are improving your riding skills. While you may visit here as a client, you will certainly leave as a friend! Your host at Morgado Lusitano is Alexandre D'orey, who speaks English and enjoys sharing his vision of Morgado Lusitano with you. You will see Alexandre though out your stay as he works tirelessly to improve the facility. and served with them family style. It is the perfect way to become part of the Morgado extended family. As you will discover when you visit, Morgado Lusitano is much more than just a horse training stable. Since 1980, Morgado Lusitano has been the center of activity for families from all over the region who enjoy coming to visit to see the horse related activities that seem to be endlessly available. How well must you ride?